SouthEast Bank executives from the Ooltewah branch visited with Southern Adventist University’s president, David C. Smith, PhD, and three of the four students directly impacted by this scholarship gift. During the lunch award meeting Caitlyn Bartlett was asked by Carolyn Hamilton, vice president for Advancement at Southern, what it meant to have received this scholarship for four years. “It means I’ll be graduating this coming May without any loan debt, which means the world to me,” Ms. Bartlett said. 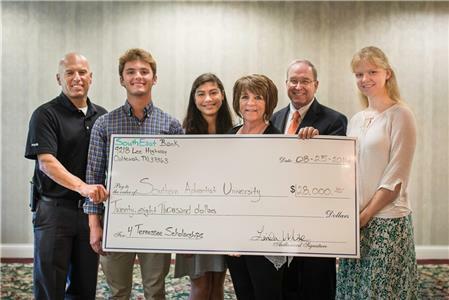 SouthEast Bank established a four-year renewable student scholarship at Southern benefiting one new Tennessee freshman on the Collegedale campus annually. The scholarship is of $7,000 per year for a potential $28,000 total scholarship award to the student. The student must maintain 3.0 GPA to receive the funds. Current students receiving the scholarship are: senior marketing major, Caitlyn Bartlett; junior financial management, Joelle Kanyana; sophomore biology major, Jesse Darwin; and freshman long-term health care administration major, Laurence Chaij.